An internet sourced compilation of tips and tricks to help you enjoy your ride. Terms are used in this article, can be referenced here. Riding in a group is likened to a flock of birds flying in a V-formation. Each bird breaks the wind for the other birds following. Likewise in cycling, depending on the wind direction, the group can help each other ride at a faster tempo, for a greater distance, compared to riding on your own. Also, safety in better in numbers. There are some unwritten rules of riding in a group (also called a peloton in racing terms). These rules are there to ensure everyone benefits, as well as keeping everyone safe. With a few centimetres separating the front rider’s back wheel from the following bike’s front wheel, you can understand why trust is a big factor. Safety – the most important responsibility, as they are the eyes and ears of the group, looking out for dangers/hazards on the riding line. Examples include potholes, glass, parked cars, slower cyclists, pedestrians, animals, etc. To get the benefit of the first two responsibilities, the cyclists behind need to trust the rider in front of them. It is important that messages/signals are pointed out to those following so they can also take evasive action. Sharing the responsibility at the front of the group is dependent on the individual strength of each rider. The stronger riders need to take more turns on the front, while the weaker riders should remain at the back. 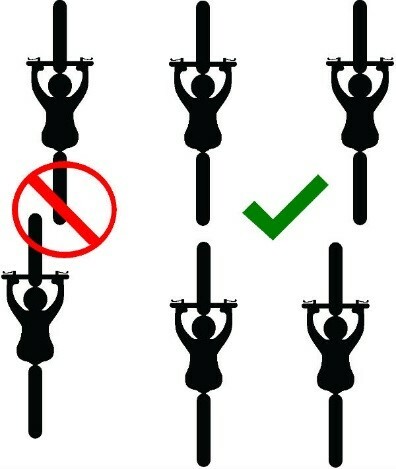 However, the stronger riders should never ride too hard so that the weaker riders are dropped. an Echelon – used when the wind is from the left of right. Using these techniques, ensures the group can maintain higher average speeds for longer distances than if only a few riders take turns up front. 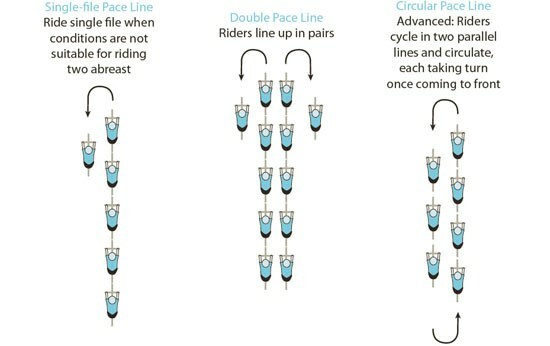 Riding in a Pace line or Echelon takes practice, but in essence is very easy to do if everyone understands the basics. Wheelsuckers are riders that sit at the back and don’t contribute at all to the pace making. These riders are not very popular, especially in a race. However, when you’re not the strongest rider, you could be giving everything you’ve got just to stay on the wheel of the person in front of you. This is called “on the rivet”, and you it is okay to skip a turn or two. When on the rivet, you tend to lose concentration and it’s important not to overlap wheels. Overlapping of wheels is the biggest cause of crashes, more so than when failing to point out a hazard. The natural thing to do when you notice you’re overlapping the wheel in front is to pull your brakes. This is the next biggest cause of crashes, as the riders behind don’t expect this. It’s called a concertina effect, which ripples to the back of the peloton. The best way is to soft pedal, or to freewheel (depending on the speed/terrain – you shouldn’t stop pedalling on an uphill). Overlapping wheels shouldn’t be confused with the action used when riding in an Echelon. Back to the front of the group, where you’ll probably find the stronger riders pulling the group. Depending on the ride, they may be on the front of the group longer than they want to. They would then signal to the rider behind to come through. If the rider comes through they will swing off the front and return to the back of the group to recover, or if no-one comes through to take a turn they will simply sit up. Other times during a ride, the stronger riders will put the hammer down resulting in an attack off the front, in an attempt to breakaway. This usually happens on a section of the route when there are crosswinds, or when the route is undulating. During crosswinds, they will ride hard enough to put the weaker riders in the gutter – this term is explained in the Echelon section further down. If you are unable to follow the wheel in front, sit up and let the faster riders pass you. As we’re a club that cares and take all the riders abilities into account, the faster riders will stop at certain points along the route, or will sit up and allow these slower riders a chance to bridge the gap. The last thing you want to do during a ride is to hit the wall, also called bonking. This is when you no longer have the energy to ride your bike. It usually happens when you exert more energy than you consume. Remember that eating and drinking is part of riding your bike. So if you know you’re less fit that some of the other riders, you may want to skip that extra turn on the front or even drop back to the slower group. Occasionally when the backup vehicle is following the group, knowing how to take a sticky bottle may help you re-join the group. This is a skill that should never be done beyond your technical ability to handle your bike, as you’ll only have one hand on your handlebars. The following graphics show the different types of Pace Lines that can be used. Ride single file when conditions are not suitable for riding two abreast. Riders line up in pairs. These Pace Lines are mainly used when the wind is from the front, or behind. A Circular Pace Line is very similar to an echelon when the wind is a Crosswind, i.e. from the left of right. Used in crosswinds, an echelon can really only be used on quite roads, or in a race with full road closure. When used correctly, the first rider is on the same side of the road as wind direction. If the wind is coming from the rider’s left, he will ride on the left side of the road. Cyclists will line up to his right until they reach the other side of the road. 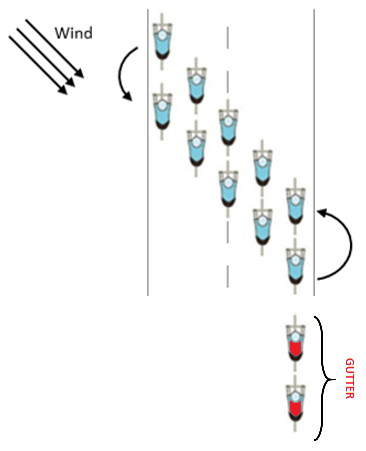 The area behind the last rider in the slipstream is called the gutter (shown in the graphic on the right as the riders in red). This is the worst place to be as you don’t have any shelter from the rider in front. The result of being in the gutter is that you end up having to ride at the same speed as the front riders without an option to drop off into the echelon. Rotating in the echelon is done the same was with a Circular Pace Line, with riders moving into the wind before dropping to the back of the group on the other side of the road. The riders dropping back always ride on the windy side of the line, so the “fresher” riders are sheltered from the wind while maintaining a steady pace. When moving to the front of the Pace Line and/or Echelon, it is important to maintain the pace/speed of the rider that was in front of you. By surging through at a faster pace means that cyclist who has just completed his turn at the front has to work harder to stay in your slipstream. This leads to fast-slow-fast-slow actions (concertina effect), which can also lead to bunch crashes. It is also the responsibility of each person in the group to point out the hazards to the rider behind them, and not only the front person. Potholes can cause punctures, damage wheel rims, buckle wheels, broken spokes and even cause a rider to crash. Likewise with glass, it can cause unwanted punctures. The rider in front should shout a warning and point to the hazard. Use your left hand if passing on the outside of the hole, right hand if passing on the inside. Riders following in the group need to pass the message right through to the back of the group. It can get so comfy sitting on someone’s wheel that the lead rider sometimes has to encourage the rider behind to take his turn on the front. A stern flick of the elbow gets the message across – you’ll have seen riders use this in races shown on TV (Tour de France, World Tour events and more). Whether approaching a T-junction, traffic signals, pedestrians or perhaps a horse and rider, the lead cyclist must alert those following that he’s slowing down or stopping. Give a verbal warning and an angled outstretched arm with palm facing downwards, indicating that you’re slowing down. Always warn each other of hazards, especially parked cars but also road works or slower cyclists. 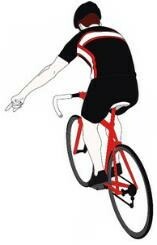 If you’re the lead rider, fold your left arm behind your back and indicate to move over to the right with a wave of your hand. (Switch arm for hazards on the right). Sometimes you’ll see riders smacking the glutes (bum) and then performing this move. The sound acts as an audible warning before the hand signal.